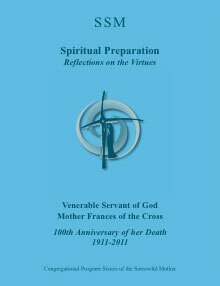 When the International Commission for the Beatification of Mother Frances and the Centenary of the Death of Mother Frances (2011) was established, we were asked to develop a simple, unified Spiritual Preparation program for the Congregation. We believe that the 12 heroic virtues of Mother Frances are a means for each of us individually and as a congregation to develop our own spiritual life using Mother Frances as a model; yet, also a means to make Mother Frances better known to others as we share our spiritual lives with them. The implementation of the Spiritual Preparation program has been developed by your provincial/regional commission so that it can better reflect the style and timing within your areas. We have tried to keep the reflections simple; yet, give you various resources to augment your reflection on the virtues themselves. Let us join together as a congregation in prayer and renewal as we delve deeper into the virtues lived by Mother Frances and passed on to us, her community members.